Hall Farm offers both bed and breakfast and self catering accommodation in a beautiful Georgian Farmhouse set in a secluded walled garden. This 500 acre working family farm is on the edge of the pretty hilltop village of Great Chishill, the highest point in Cambridgeshire. 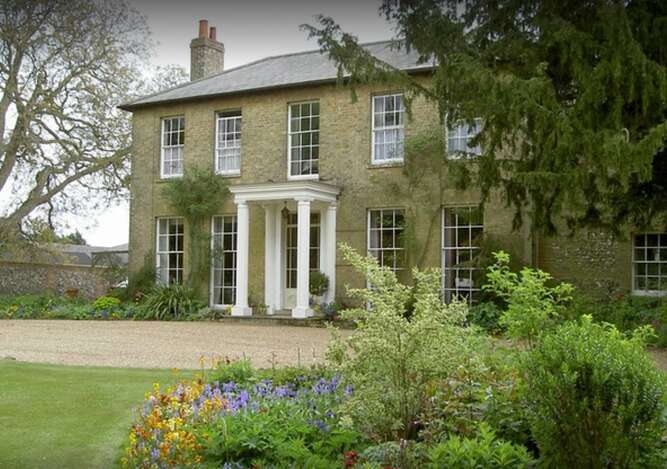 We are on the B1039 midway between the towns of Royston and Saffron Walden, ideally situated for Stansted Airport and the Cambridge/Liverpool Street and Cambridge/Kings Cross train lines with Royston and Audley End Stations both being just 5 miles away. Cambridge 'Park and Ride' at Trumpington is a 20 minute drive. The Pheasant public house is a 5 minute walk and serves extremely good food in a friendly atmosphere. All the surrounding villages also have wonderful pubs - see our 'Attractions' page for plenty of suggestions as to where to eat and drink. We have single, double, twin and family rooms as well as ground level rooms with wheelchair access and self catering facilities.